A soldier who made ale for his homesick comrades in World War One is being honoured in Belgium 100 years after his first brew. 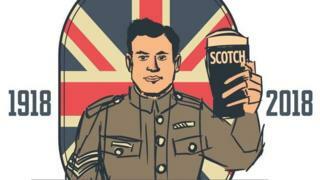 Sgt Jack Payne from Shepreth, Cambridgeshire, first produced Silly Scotch Ale on 13 October 1918. 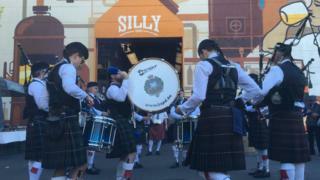 It was named after the town of Silly in west Belgium where he was stationed with the Suffolk Regiment. 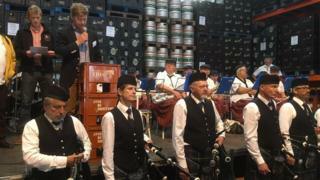 Family from the UK and Belgium have gathered at the brewery to toast his memory with the ale. Brasserie de Silly brewery owner Bertrand Van Der Haegen said: “Jack wasn’t a brewer, but he knew how it should taste. 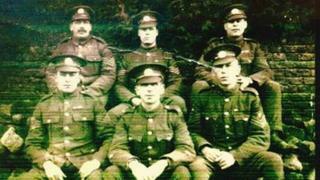 Hops were in short supply in the summer of 1918, but Sgt Payne’s unit commander managed to order some from Kent. He worked with Brasserie de Silly to create a coppery, red British beer to satisfy the thirst of his fellow soldiers. 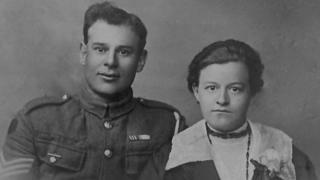 After the war, Sgt Payne married his Belgian sweetheart Emilie Timmermans, worked in the brewery for many years and died in the town aged 86. Angie O’Neill, from Bury St Edmunds in Suffolk, is one of a number of cousins who are attending the centenary celebrations. She said: “We knew about Uncle Jack being a soldier but the beer thing is all new to us. Image caption Those attending the celebrations witnessed speeches, music and entertainment. Stephen Payne, another cousin from St Ives in Cambridgeshire, said it was “an incredible story and he was an incredible man”. A new label has been created to mark the 100th anniversary of the beer, bearing an image of Sgt Payne in uniform holding a glass of Silly Scotch.